I’m starting to think that maybe law isn’t my thing. This worries me. I had dragged myself through three years of college pre-med before I realized doctors don’t get Cs and Ds in organic chemistry. So I landed in law school in DC, but now instead of spending my days reading antitrust law, I’m reading blogs about wine. Wine and law is a natural combo, right? I mean, we can all think of at least one lawyer who’s somehow found his way into wine. I rationalize my obsession by saying that one day I’ll own a restaurant or wine store. It’s just research. 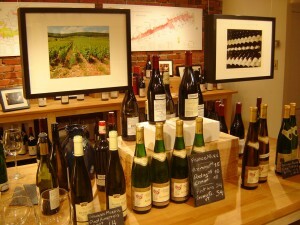 Last December a new wine shop, Ansonia Wines, opened here in the North Dupont neighborhood. It’s the retail outpost of a wine importing business run by Mark Wilcox—who incidentally practiced law in Philadelphia for over twenty years. The cozy shop in the basement of a row house is run by Mark’s son Tom, a recent college graduate. It’s a true père et fils arrangement, as their selection is almost completely French: Southern Rhône, Alsace, Bordeaux, and their specialty, Burgundy. Burgundy is arguably wine’s most complex and intimidating appellation, and also one of the most expensive. It has a dizzying array of producers and regions and villages and vineyards, each with differing levels of quality, and each subject to the vagaries of vintage. Here’s an example: the 2006 Roger Belland Santenay-Beauregard Premier Cru. Roger Belland is widely acknowledged to be a talented producer, and one whose wines I would unilaterally trust. Good enough there. 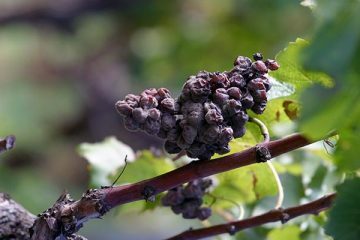 “Santenay-Beauregard” here refers to the sub-appellation, Santenay, as well as the specific vineyard, Beauregard. It gets a bit more complicated. Premier Cru (sometimes designated 1er Cru) says this wine lies at the second-highest level of quality assigned to a specific Burgundian vineyard; Grand Cru is at the top, Village is lower, and a wine marked simply “Bourgogne” or “Burgundy” is at the bottom. I started getting into Burgundies, and thought perhaps working at a wine shop like Ansonia would give me insights into opening my own store and help me learn more about these wines. I e-mailed Mark and Tom inquiring about employment, and they told me to bring in a resume. I visited the shop a few more times shortly after, and somehow convinced them of my earnestness, if nothing else. Tom agreed to take me on as a temporary manager to fill in when he was on vacation or wine buying trips. Last February I got the chance to run the store for nearly a full week. My first day on the job was a Saturday, which as it happened was the day before Valentine’s. Tom handed off the key, the passwords to the computer system, the inventory list, and a set of instructions before heading to a wine buying trip in France. Ansonia is a one-person operation. I was on my own. I was fairly confident in my general knowledge of wine and wine regions, and I’ve had years of retail sales experience. But now I’d have to find some way to talk about this load of Burgundies without sounding like an idiot—or worse, leading people astray. Customers would depend on me to help them pick out a great bottle. To borrow from William Carlos Williams, so much depends upon a red (or white) wine: the fate of a first date, the celebration of Saint Valentine, or any other event, major or minor, they had planned that weekend. On the first morning, per Tom’s instructions, I opened two bottles for the day’s in-store tasting, brushed up the store a bit, turned on the lights, and—before I could even unlock the front door— there was a knock. My first customer! I excitedly poured him a taste. Almost immediately another group of three came in. I poured them tastes, too. Man, if the rest of the day was to go like this, I was going to sell every bottle in the place! Unfortunately, I found it was somewhat harder to earn one’s keep than I’d imagined. The first customer ended up buying only one $20 bottle. The group of three browsed awhile, tasted both wines, and left empty handed. Then followed a twenty-minute period with just me and Neil Young on the stereo. But the day turned out to be busy. The most popular wines were lower-end, especially Côtes-du-Rhônes, though I did manage to sell a few bottles of Premier Cru Burgundy. Over the course of my week I gleaned a number of valuable insights. For instance, people are more likely to purchase a bottle of wine they’ve tried in the store. It had occurred to me that I should know more about the wines here, so I purchased and opened a few bottles myself and shared them with the customers too. This led to a couple of big sellers, a Pouilly-Fuissé from Annie Claire Forest and the “L’Inedit” Côtes-du-Rhônes from Domaine les Goubert. I also learned that people are more likely to purchase if you ask them to provide you with some context. Are you looking for a wine for dinner tonight? Is this for a special occasion? Listening to them, trying to be responsive to their needs, and treating them with respect also help ensure they come back. But the biggest lesson I learned was that running a wine shop is hard work, a labor of love. Fortunately, there’s a lot to love about it. On my last day, a minute or two before closing time, a young couple came in to browse. They seemed quiet and noncommittal, and I wearily offered them a taste. I didn’t think they were likely to buy anything, but then I offered them a second taste, this time of that Santenay-Beauregard. The woman’s face lit up. She liked it a lot. The man asked the price. Thirty-three dollars?! she exclaimed. That’s too expensive! He paused. Do you like it? he asked. She nodded quietly, looking into her glass. He looked at her, and then looked at me. We’ll take a bottle. You should have seen her eyes. 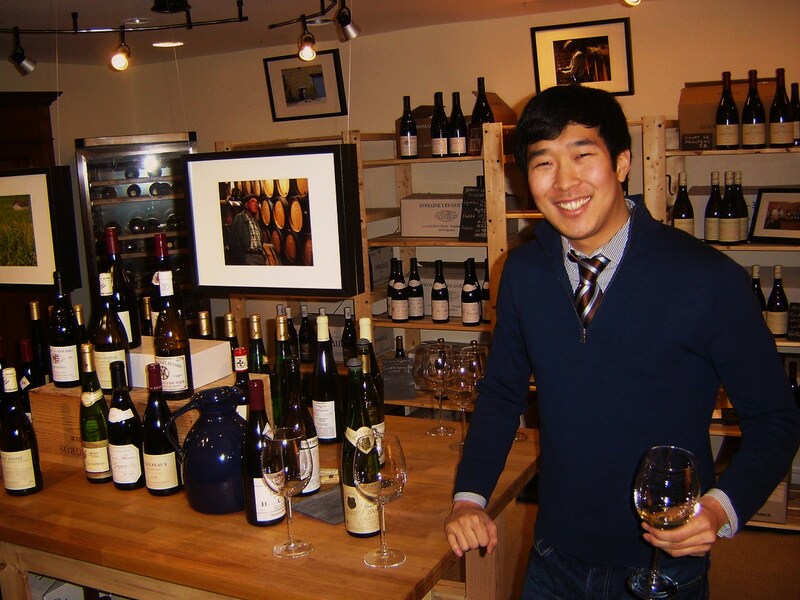 Joon Song is a native Angelino who discovered his budding love of wine during his college days in the Bay Area. After a few years back home, he left for law school in D.C., where he will remain until the spring of 2011. 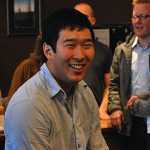 When he’s not busy being a law student or fighting Snowpocalypses, Joon enjoys learning about and drinking wine. 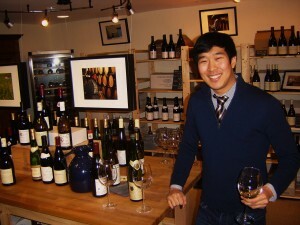 He is the author of Vinicultured: A Wine Blog and writes a wine column for GW Law’s student newspaper. Good Luck with the law! There is plenty of it in wine. Hey Neighbor! I’m a DC based wine professional and author of “I Drink on the Job: A Refreshing Perspective on Wine” – I run TasteDC full-time with wine classes and “foodie” events. Would love to hear from you – Cheers! As one who has worked wine retail for several years, I appreciate your post on this subject. I found it very honest, accurate, and well observed. And, thanks for mentioning that it’s hard work — it’s true! But I wouldn’t have it any other way. It’s interesting that you bring up the tasting aspect of wine sales. It’s something that we struggle with basically on a daily basis as an online wine club. We find that any way we can pour for people directly seems to dramatically increase our sales. I think part of the reason people opt for cheaper wines is because they don’t trust themselves to be able to tell the difference. Thank you to everyone for your kind comments. It was definitely an eye-opening experience for me, and if anything it whet my appetite to get more involved in the wine industry. And to those who reached out to me: I appreciate it! I will get in contact with you–that is, after law school finals are over! being an entrepreneur can give you a good deal of money, ‘..